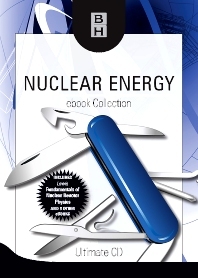 Nuclear Energy ebook Collection contains 6 of our best-selling titles, providing the ultimate reference for every nuclear energy engineer’s library. Get access to over 3500 pages of reference material, at a fraction of the price of the hard-copy books. Dr. Gianni Petrangeli is Consultant to the IAEA (International Atomic Energy Association) for the preparation of nuclear safety guidelines and participation in safety evaluation missions. He is a researcher for nuclear safety for the European Commission and a member of the Faculty Council for the Doctorate in Nuclear and Industrial Safety, University of Pisa, Italy. Dr. Petrangeli spent time as a Professor of Nuclear & Industrial Safety and Environment at the University of Roma, and at the University of Pisa where he received his Doctorate in Nuclear and Industrial Safety and was also a Professor on Complex Safety Systems.